Economics studies human behavior - like all of the social sciences. But of course the direction the discipline takes is particular. The fundamental premise in economics is that human wants are unlimited whereas resources are limited. Therefore, economics as a discipline deals specifically with the choices people make, either individually or in terms of aggregates in the context of scarcity. Economics provides students with an intellectual framework of different theories, models and concepts with which the economy and economic decisions in real-life can be analyzed and explained. 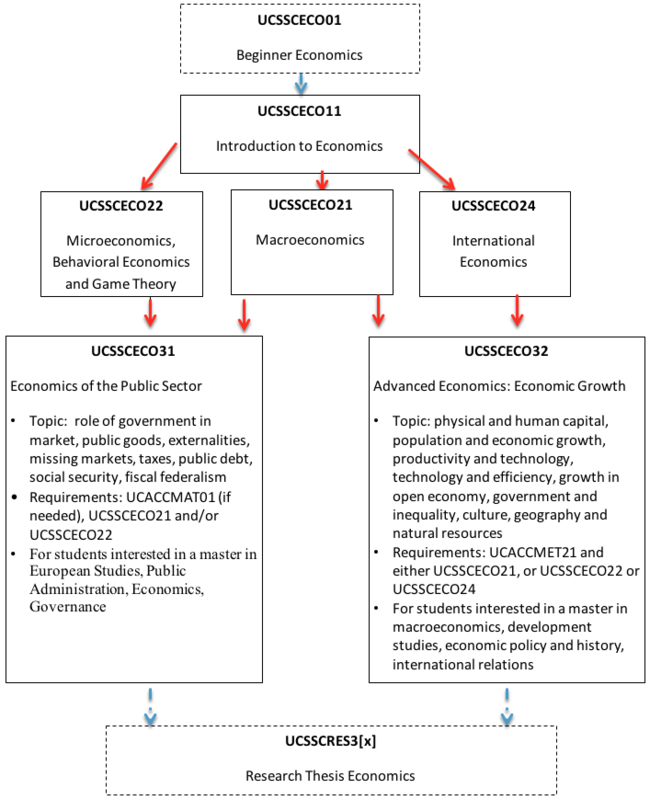 UCU offers a track in economics, starting with an introductory course. After this course, basically two directions are open in the track: a macroeconomic direction (including an international perspective) and a microeconomic route. The full track joined with off-campus courses (econometrics) or some economics course followed on exchange should give full admission to a regular master's in economics. Note: UCU does not offer a track in business. What is the relation to other tracks or courses at UCU? Economics draws on a number of other disciplines in the social sciences, mainly sociology, psychology and political theory. [However, the tradition in economics is close to that of the sciences, especially physics.] The following courses especially add value and give a complementary or different point of view on topics dealt with in economics. The small list below is not exclusive regarding the relevance or interest for economists. How can I plan this track? Students who need to take the required mathematics course UCACCMAT01 Mathematics for Liberal Arts and Sciences are recommended to do so in their first year so they can participate in the level-2 courses in the second year. Apart from this the usual recommendations apply: level-1 in the first year, -2 in the second and level-3 in the third year. Note: students should plan ahead as most level-2 and -3 courses are taught only once a year! Which are relevant masters programs and how do I prepare for them? Students who wish to continue with a master program in economics are strongly recommended to take both micro- and macroeconomics and econometrics. A course in econometrics is available at Utrecht School of Economics (U.S.E.) in block period 2 from November to January. Note that registration to U.S.E. courses for Fall semester (block periods 1 and 2) is in May-June of the preceding academic year in which the course is followed. Students who wish to continue with a regular master's program in business are recommended to take the course Essentials of Business and Entrepreneurship at U.S.E. This course is offered twice a semester (four times a year). A course in Corporate Finance is also often required (available at U.S.E. in semester 2: block period 4) for a master's in Business. Another option for UCU-students interested in Business is a minor in Business and Entrepreneurship at U.S.E. This minor entails 4 courses. Note that you can start your minor with the level-2 course in Introduction to Business. The Beginner Economics course is exclusively meant for those students who have no or limited knowledge (under two years) in the discipline of economics and (initially) no aspirations in economics as a track. However, students are supposed to have a serious interest in economic issues as it comes to us in everyday life, e.g. through the headlines in the news. For example, should Europe pursue further economic and political integration? Should countries protect their domestic industries in order to save employment and bring jobs back? How come that certain established retail stores are all of a sudden on the verge of bankruptcy? Should governments start to invest more or continue with austerity policies when ‘the economy’ is growing? In order to follow this kind of news and have a somewhat better understanding of what’s happening in the world and national economy it makes sense to have an elementary knowledge of economics as a scientific discipline. Besides, economics provides also an approach on how individuals like yourself make choices. Should you consume this or that? Should you spend more time studying or less? Should companies produce more or less? The science of economics gives you a framework for understanding these kinds of decisions as well. Beginner Economics introduces disciplinary vocabulary, fundamental concepts, theories and models that are used in economics as a scientific discipline. Next to that, in this beginner course the discipline of economics is placed in the wider field of the social sciences and introduces some history of economic thought. The purpose of this is to have an understanding why economics as a discipline is by and large close(r) to the sciences (than it is to humanities). In this beginners course game theory, mathematics (i.e. calculus) and statistical analyses are completely stripped out. Verbal explanation and graphical exposition are central in order to get properly acquainted with the discipline, the disciplinary vocabulary and some of the elementary theories and models as visualized in graphs. As much as possible the connection to real-life is being made in order to develop critical thinking in economics from the beginner level onwards. After completing this course students are able to read and understand simple economic texts and introductory textbooks. Moreover, at the end of the course the student should be able to ‘translate’ and ‘present’ general real-life issues as an economic problem. The economic problem should then be ‘solved’ by using the disciplinary language and approach (e.g. graphs) used in the economic discipline. Students with economics in their VWO exam program or IB/EB program are advised to take the Introduction to Economics (UCSSCECO11) course when starting the Economics track or pursuing just one course in Economics. The course Introduction into Economics brushes up the knowledge acquired and continues with the essentials of micro- and macroeconomics as they were taught in high school. It is an ‘advanced’ introduction to the discipline, bringing in new subjects and using some standard ‘tools’ for economic analysis. The course is meant for those students who had economics in their high school exam program, desiring to pursue the Economics track or just following one course in Economics at an advanced introductory level. The course Beginner Economics precedes this course and is meant for those students who haven’t had economics in their high school exam program. Essentially, microeconomics analyses choices of individuals: the consumer or producer, employer or worker. The way organizations and institutions might intervene, interfere or (re)direct the choice set of those said individuals is also part of microeconomics. The main tool to be used in microeconomic analyses is mathematics. Therefore the microeconomic part of this ‘advanced’ introduction combines a verbal and graphical understanding with mathematical reasoning. Some basic level of math, esp. calculus is helpful. New subjects covered in this part of the course (microeconomics) are for example the labor market and the public sector and some game theory. Macroeconomics studies aggregate economic phenomena such as the growth of the economy, unemployment, inflation, international trade and the balance-of-payments. The ‘tool’ most often used in macroeconomic reasoning is statistical analysis. Therefore the macroeconomic part of this ‘advanced’ introduction combines a verbal and graphical understanding with statistical reasoning. Some basic level of statistics is helpful. New subjects covered in this part of the course (macroeconomics) are for example different schools of thought and different growth models. Since this course brushes up previously acquired knowledge the content may to a more or lesser extent overlap with the high-school exam program. However, this does not qualify for an exemption for (part of) this course since essential parts of this course on which the level 2 courses continue are usually not taught in Dutch high-schools, IB or EB. Moreover, the explicit connection with the main tools for economic analyses (game theory, mathematics, statistics) has not been made before. After this level 1-course one should be ready to step in any of the three level-2 courses that are taught in UCU (or many other level-2 courses in economics taught at Utrecht School of Economics or elsewhere): Macroeconomics (UCSSCECO21), Behavioral & Microeconomics and Game Theory (UCSSCECO22) or International Economics (UCSSCECO23). The level 2-courses on Macroeconomics, International Economics and Behavioral & Microeconomics and Game Theory elaborate on the knowledge acquired in the preceding course by looking at respectively aggregate or individual economic issues in a more advanced, detailed and mathematical / statistical way. The course Behavioral and Microeconomics and Game Theory also adds a short introduction to Behavioral Economics and Game Theory, whereas Macroeconomics and International applies statistical reasoning of country data. For all three courses at the level 2 Mathematics for the Liberal Arts and Sciences (ACCMAT01) is a prerequisite – unless Math B was part of the Dutch high school exam program, or equivalently IB Math HL. For Macroeconomics and International Economics the course Research in Practice (UCACCMET12) is an additional prerequisite. This course continues where the introduction course stopped regarding the macroeconomics. At the end if this level-2 course students should be able to describe macroeconomic concepts and engage with real (statistical) data, use theoretical models to analyze contemporary economic policy issues, and apply insights from theoretical models to these policy issues. Topics that are covered in this particular course are e.g. economic growth; inflation; unemployment; expectations; depressions and slumps; role of the government; monetary policy; and (of course) aggregate demand and supply. Macroeconomics is required for taking economics courses on exchange (e.g. Berkeley) and certainly required for (most) master programs in economics in the Netherlands or abroad. Behavioral & Microeconomics and Game Theory builds on the foundations of microeconomics laid down in the course Introduction to Economics. The student gains insight into modern microeconomic concepts, discusses current microeconomic issues and should be able to describe the background of current controversies about these issues. Next to this concepts and methods from game theory and behavioral economics are introduced, explained and applied. At the end of this course the student should be able to analyze decisions from a microeconomic (i.e. individual) perspective. Topics that are covered in this course are for example decision making (following rational choice) by individual households and firms, the economics of information, supply and demand, externalities, and labor issues. Microeconomics may be required for taking economics courses on exchange (e.g. Berkeley) and certainly required for (most) Master programs in Economics in the Netherlands or abroad. International Economics aims to introduce the main economic theories in international trade and demonstrates insight into the politics of international economic relationships. At the end of the course the student should be able to describe and discuss trade theories and international macroeconomics. Moreover, students can apply their theoretical knowledge to the practical real-life policy debate and combine (statistical) data collection and analysis with theory in a country report. This course is strongly recommended for anyone interested in a master program in International Economics in the Netherlands or abroad. * UCACCMAT01 is required for students continuing in Economics who did NOT take IB Math HL, Dutch VWO "Wiskunde B" (B1 ánd B2) or similar "Calculus and Algebra" courses from a foreign high school. If in doubt, contact the teacher before you enroll for this course. The two level 3-courses in the economics track at UCU apply the concepts learned in the courses at the lower level(s) and focus on a specific area of economics: Economics of the Public Sector respectively Economic Growth. The former is essentially applied micro-economics and focuses on the role(s) and function(s) of government in modern capitalist economies; the latter is a continuance of macroeconomics and international economics. Both courses are advanced in terms of application, level of detail and mathematics and statistics. In real life, individuals and firms are constantly confronted with the influence of the government. Indeed, the public sector has become an enormous economic force in most developed countries. This course examines the role of government in the market from an economic perspective, posing question such as: What precisely is the role of the government and why does it intervene? How should it intervene? Under what conditions does government intervention improve social welfare? What is efficient and what is fair? The course focuses on concepts like public goods, externalities and missing markets. And since the supply process can be understood as a production unit, it focuses on the role of government in decision-making (cost-benefit analysis, competition between political parties, voting rules, bureaucracy). Topics to be covered include the effects of taxation on individual and firm behavior, public debt and deficits, different types of welfare states around the world and their main advantages and disadvantage and fiscal federalism and public choice. Moreover, in this course the students can select some capital selecta, which they want to cover within the set boundaries of this course. Lucas once said that it is hard to think about anything else when you realize the importance and impact of (the absence of) economic growth on the lives of people in the long run. Understanding long run economic growth is considered the Holy Grail in macroeconomics and it has attracted the best and brightest minds to the field. Still, a lot remains to be researched and understood. This makes economic growth an exciting area of research and study. In this course the importance of economic growth is placed in a historical perspective and the necessary conditions for economic growth are being explored. By using formal models economic growth is analyzed, and with these analyses insight into the effects of economic policy on growth is given. An economic growth process is systematically analyzed based on economic theory and empirical data. This course gives an overview of the causes and effects of economic growth and the theories and instruments that economists use to explain economic growth. We are especially interested in explaining the differences in the rate of growth of different countries and in different eras. The material covered by the course ‘Macroeconomics’ includes the role of savings, the capital stock, population growth and (exogenous) technological progress. All of these were discussed in the context of the Solow model. This course goes beyond that model and scrutinizes the role of a large number of other factors, e.g. demography, human capital, innovation, globalization, institutions, geography, government policy, cultural differences and raw materials. Several models that economists use will be discussed to explain the impact and effect of such considerations on economic growth. An overview of all off-campus courses can be found on Osiris. Find information about how to register for off-campus courses at U.S.E. Note that in order to take courses elsewhere at the UU, the off-campus request form need to be approved and signed by your UCU-tutor and the request need to be approved by the UCU Exam Board. Note however that registration to U.S.E. courses for fall semester (block periods 1 and 2) is in May-June of the preceding academic year in which the course is followed. Erwin van Sas teaches Introduction to Economics and Economics of the Public Sector. He obtained a degree in Economics from the Maastricht University in 1995 and a degree in Political Sciences from Pierre Mendes-France University, Grenoble (France) in 1994. He started in 1996 at Utrecht University and taught economics at the Law Faculty after which he started to work for Utrecht School of Economics (and its predecessor). He taught a variety of courses, where his heart is with multi- / interdisciplinary courses, esp. the interplay with economics, political sciences and law. At UCU he is the economics track coordinator and works also as a tutor (academic advisor). Kim Zwitserloot teaches Introduction to Economics and Behavioral & Microeconomics and Game Theory. She obtained her MSc degree in Economics from Maastricht University in 2004. After her graduation she spent some time in Venezuela teaching English. When she returned to the Netherlands she worked at Maastricht University as a tutor (teacher) in the Problem Based Learning system, before moving to Utrecht to work as a teacher at the Utrecht University School of Economics. Since 2007 she has been employed at University College Utrecht, where she - besides teaching - works as a tutor (academic advisor) and is responsible for international marketing. Marc Schramm teaches Macroeconomics and International Economics at UCU. He is employed by Utrecht School of Economics. He obtained his economics degree at the Erasmus University Rotterdam. His PhD was in the Radboud University of Nijmegen. Drs. Erwin van Sas is the track coordinator for Economics at UCU and has his office in Voltaire-Dd.